An observation from last September’s Australasian Transport Research Forum conference was the abundance of academics versus the paucity of practitioners. I define practitoners as those who plan and operate transport routes or closely work with those who do. They have their own work and don’t write books and attend conferences as much as academics and bureaucrats. Having read books by academics such as Mees, Newman and Kenworthy, I was particularly interested in the different perspective that a practitioner might bring. Academics thrive on research, teaching and (sometimes) political advocacy. However the affordability, practicality and acceptance of their recommendations may not frequently be tested. Whereas practitioners need to be more practical and less theoretical. They must often work within existing resources; something academics might find limiting. Consultants can be practitioners too but won’t get work if not seen as useful. In Human Transit, Walker describes himself as a plumber. We don’t expect plumbers to tell us how to run our cities and our lives; unlike (say) priests, politicians and talkback radio hosts. They may hold values but cannot choose them for their clients. But they might be able to advise on the consequences of particular decisions; for instance the cheap quick fix versus the dearer but enduring repair. And they might point out that any option chosen must respect basic laws, like water flowing from high to low, for the system to work effectively. City planners and developers deal the hand with which transit planners must work. Some decisions, notably with respect to density, are controversial. Walker, more than Mees, sees density as conducive to higher patronage. However he adds, correctly in my view, that location and geometry are equally critical when designing neighbourhoods for direct and efficient transport routes. To Walker these factors are public transport’s equivalent of the plumber’s basic laws. If disobeyed an area may never be easily or efficiently served by good public transport. Transport networks themselves can be optimised to favour patronage or coverage goals. Networks that optimise patronage generally have direct, fast, frequent but more widely spaced routes, whereas a coverage-oriented network sacrifices directness, speed and frequency for short walking distances. Walker insists that transport authorities set a resource allocation policy between ‘patronage’ and ‘coverage’ routes. Only after such priorities, and thus available resources, are known can the service planner design the network. 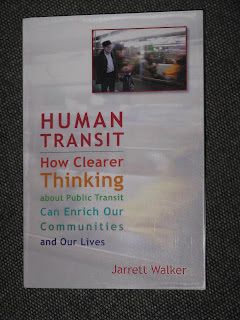 The book is a mine of simple but often neglected insights that would make public transport better. All are applicable to Melbourne. For instance the trade-off between directness, frequency and legibility on the one hand, and requiring that people change for some trips. We’re used to road maps having different thicknesses for different types of road, from lane to freeway, so why not do the same with transit maps, highlighting our most frequent,and thus most usable routes? And, on busy roads, the contribution of the humble pedestrian crossing to improving access to bus stops and the impetus it provides to gradually increase an areas’s walkability (and thus transit access). Human Transit does what its title suggests. It forces the reader, from layperson to transport planner, to sharpen their thoughts and ask the right questions. I highly recommend it. Human Transit is published by Island Press and is available via the link below. -just talking about your blog on Josh Arbury. When we pulse a rail/bus connection. Assumption is the bus arrives at the station drops off pax, then train arrives, drops pax for bus, then train departs, then bus departs. This is based on the train requiring short dwell time (because station could be small wayside stop) while bus can afford to dwell longer because likely route terminus. But what if it isn't the route terminus? Should rail stations always be the bus route terminus to allow pulsing? If a 900 series Melbourne route passes a station like Nunawading or Glen Waverley, the bus might get there in time for the train, but not vv. And if the bus waits at the stop through the ETA of the train, then through pax on the bus are disadvantaged? Solutions? No bus through routes? No pulsing (ie TUAG as minimum)? Mark in timetable that bus and train or vv do not connect? Ricc - all are solutions, though note that the problem lessens if one of the services becomes more frequent. Improving trains in this regard has great benefits for buses and should improve whole network patronage. Trains every 10 min (eg on the Frankston line weekdays and stopping all stations) is considerably better for worst case train-bus connectivity than a 30 minute service at say Croydon. Sure the latter has off-peak am expresses but the time saving is gobbled up by the low frequency, making its benefits dubious. But once frequency gets to a certain point then the dominant issue becomes travel time (not wait time) and it is here that we should be looking at a two-tier all-day timetable on our major lines. The critical frequency depends on average journey length, but I think 10 min is probably right for most of the suburban rail system, and maybe 20 min for some outer portions. For denser inner portions of metro rail - 5 min (though we don't have much of this as density drops significantly away from CBD). CBD trams on major streets also a few minutes only (already achieved). TUAG is our gold standard, and even if we don't have every single bus route or outer portion of rail (eg Hurstbridge), a method of determining travel times based on random arrivals is still a good judge. The next tier below TUAG is a pulse timetable, though note this demands high train reliability and some trade-offs re efficient route lengths for buses (to be able to efficiently operate at pulse harmonised frequencies). For major routes like most parts of the SmartBus orbitals, a TUAG type frequency is warranted. I wouldn't have buses waiting at stations for trains if frequency of both is high (time is money and is best put into increased frequency). But for local routes pulse is the way to go. But where you don't have corridors that quite justify a high service with its own routes, you'd do all you can to use two overlapping routes, times evenly spaced, to provide equivalent TUAG service over the combined section (we achieve this with routes like 250/251/253). The need for a short frequent combined section is common in outer suburbs where the biggest shopping centres are off-rail - eg Melton, Werribee Plaza, proposed Craigieburn, Cranbourne, etc. But you could also do it for Oakleigh - Chadstone (already enough buses - the main issues here are off-peak train frequencies and bus priority). Longer combined co-scheduled sections are desirable on main roads, along the lines of the Adelaide Go Zone model where it's not possible to replace multiple routes with several. Re "patronage" vs "coverage" goals: I agree that planners need to work out what they're seeking. But as a sub-set (or perhaps it's right off the topic? ), what about bus services within and close to the CBD? Trams cater for crowds of people travelling the length of Collins and Bourke Sts (etc), but are we missing opportunities to utilise the Queen and Lonsdale St buses for intra-CBD travel? Is this being actively discouraged, or does it just seem that way? Likewise, the DART buses to/from Victoria Pde, and the 216/219/220 routes to/from St Kilda Rd and the Arts precinct?